The focus of our Intellectual Developmental Disabilities (IDD) Program is to assist individuals and their families in choosing and accessing quality and cost-efficient services and supports that best meet their needs and requests. Our IDD Program accomplishes this by offering an extensive array of services and supports either provided through Bluebonnet Trails or through a network of private and public agencies and organizations. Our Intellectual Developmental Disabilities Services provide intervention, therapies and supports throughout a lifetime allowing persons to reach their greatest potential – including eligibility determination, early intervention for babies and toddlers, autism services, enrichment centers, respite, companion care, community supports, employment assistance and service coordination. Eligibility Determination: A determination of eligibility is an assessment (or endorsement of an assessment) to determine if a person has an intellectual disability or is a member of the DADS priority population for IDD. The assessment uses standardized tests to determine a person’s IQ and adaptive behavior level (ability to perform life skills) and is conducted by a qualified professional. An assessment typically includes an interview with the person, the person’s legally authorized representative, or if the person doesn’t have an LAR, others who are actively involved with the person. Early Intervention for Babies and Toddlers: Please visit our Early Childhood Intervention Program for more details. Autism Services: Please visit our Autism Services for more details. 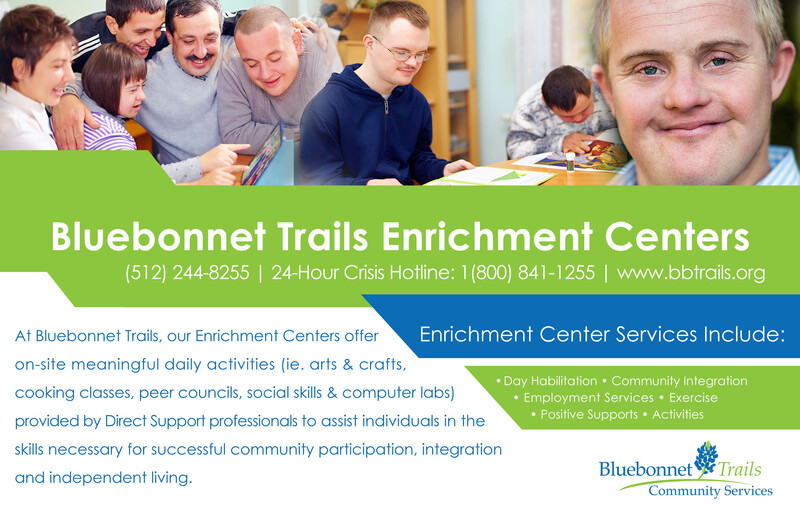 Enrichment Centers: At Bluebonnet Trails, we offer on-site meaningful daily activities provided by Direct Support professionals to assist individuals in the skills necessary for successful community participation, integration and independent living. Respite: Our Respite services provide temporary non-routine assistance to the caregiver by assisting the individual with daily living tasks and providing needed supervision. Companion Care: Bluebonnet Trails’ Companion Care provides a safe environment within the community for an individual to live as independently as possible. Community Supports: Our Community Supports offers small groups or one-on-one activities conducted in the individuals’ home or in the community to support the individual’s ability to live with the maximum amount of independence. Employment Assistance: Bluebonnet Trails provides assistance in order to sustain competitive employment or self-employment to an individual who, because of disability, requires intensive, ongoing support. Services include employment adaptions, supervisor training related to individuals’ assessed needs, and earning at least a minimal wage (if not self-employed). For more details on our Employment Assistance programs, please click here. Service Coordination: Our Service Coordination services help people access medical, social, educational and other services and supports that will help an individual achieve an acceptable quality of life and community participation. Service coordination is provided by a staff person who is referred to as a Service Coordinator. Children Crisis Respite: Our Children’s Crisis Respite services help resolve crises by offering a short-term, voluntary placement of up to 45 days per fiscal year in a therapeutic and safe environment. Children placed into this program can be released to parents or legal guardians at any time. Within the program, we will assist children in linking to other resources to meet their needs more comprehensively and/or assure that they continue in already established services. 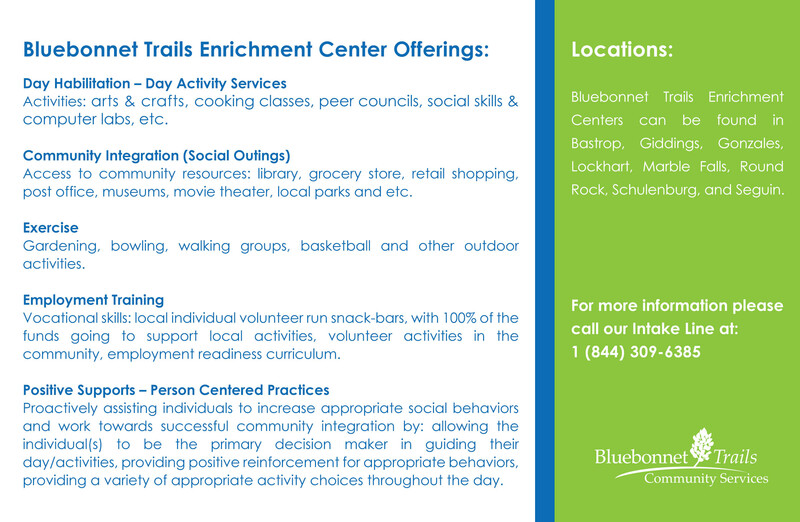 These services may be provided by Bluebonnet Trails or other community agencies or providers. We strive to stabilize the child with the objective being to return them to their natural setting as soon as possible. Referrals for family members/caregivers are provided where needed during the course of treatment so that all members of the family unit may have needs addressed. Bluebonnet Trails is devoted to providing the most exceptional care for individuals diagnosed with an Intellectual Developmental Disability and/or Autism. In our IDD Crisis Support Team we provide up to 90 days of wrap around crisis prevention services including: service coordination, skills training, respite, nursing services, behavioral supports, counseling, Applied Behavioral Analysis therapy, and psychiatric assessment/medication management. The goal of our IDD Crisis Support Team is to provide timely and individualized specialized services to individuals and their families, targeting a decrease in crisis behavior and an increase in the individuals’ ability to calm themselves and/or their caregivers’ skills to assist them in the process. We strive to stabilize an individual and remove the risk for out-of-home treatment or placement. An individual is engaging in repeated self-abuse or other high-risk behavior (not including suicidal or homicidal behavior). An individual has lost a caregiver or is at risk of losing a caregiver due to an inability to manage the individual’s care or other reasons. If you are interested in this residential option, contact us at 1-844-309-6385. We will assist you in applying for the service. The application process for admission to an ICF/IID involves sharing an individual’s diagnosis and medical and support needs with ICF/IID providers to ensure they have the appropriate services and resources to best meet an individual’s needs.